You may remember that shirin (as in shirin polo ) is an adjective meaning “sweet” in Persian. Perhaps you even recall that Shirin is also a popular name for girls in Iran. And of course a girl was supposed to remain a maiden until lawfully wed. Ahem. But back to our story! Torshi – as in “something sour” – is what pickles are called in Iran. They can be made with cooked or raw fruits, or vegetables, or herbs (or a combination thereof) preserved in vinegar and salt, and jazzed up with spices. Some types of torshi are ready to eat immediately after being prepared, while some require being aged (as little as a week or two to as long as seven years for a particular type of garlic torshi) before they are ready to be served. 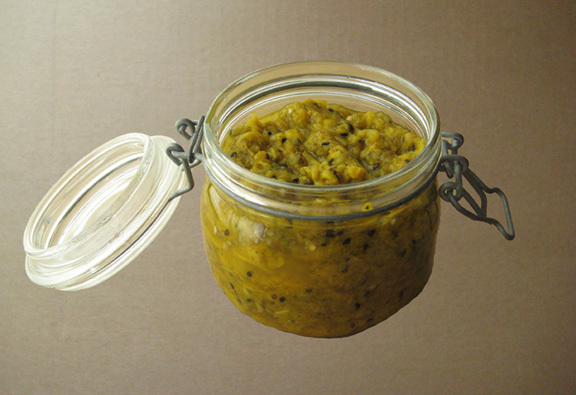 A good torshi is a tangy, tasty, textured condiment that enhances the pleasure of the main dish. Iranians can’t get enough of torshi: it is an oft-present presence at sit-down family meals, and at least one type if not more variations of it are certain to be offered as part of the accoutrements of a typical festive Persian dinner party. 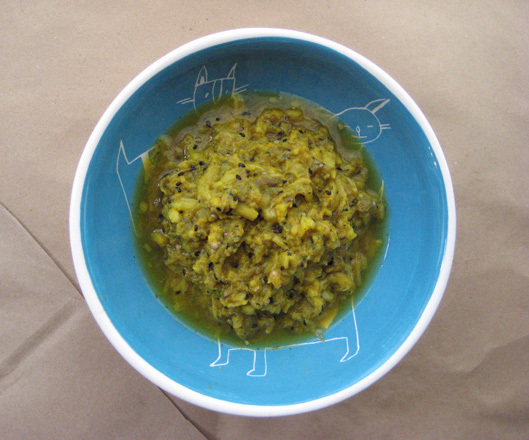 Torshi ‘ye bademjan is one of my favorite homemade Persian pickles. I appreciate the eggplant flavor and its soft yet slightly crunchy texture. It is by no means an effortless relish to prepare, but on the other hand, it does not require a panoply of ingredients and spices as some high-maintenance types of torshi are known to demand. Aside form vinegar, all you will need are a few good eggplants; plus a little bit of turmeric, black seeds (they look like black sesame seeds and are also known as black cumin or nigella seed), angelica powder, and corriander seeds, and you are good to go. If you like eggplants and tangy condiments, you will very much enjoy this. Allow to cool to touch. While still warm, peel the eggplants, leaving the crown intact for the moment. (It will be harder to peel them if they get cold.) Make 4 diagonal cuts in the flesh of each eggplant, pull open the sections (but do not disembowel) and discard as much of the seeds as possible. Sprinkle eggplants liberally with salt. Place in a colander above a big bowl allow to drain for at least 3 hours or even overnight. Discard the crown and remove any remaining seeds. Chop eggplants into small pieces. 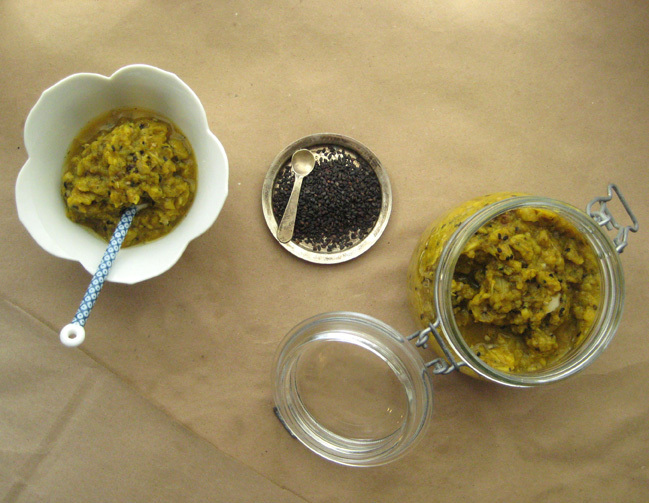 In a bowl mix eggplants with turmeric, black seeds, coriander seeds and angelic powder. Stir with a fork and mix well, but gently. (Don’t smash the eggplants.) It is normal if the mixture produces a bit of juice. Simply stir to mix in the juice with the mixture. Add more turmeric if necessary to get a nice color. Optional finishing touches: add dried mint and a clove or two of garlic; stir to mix. This torshi can be served immediately but it really comes into to its own and its prime (ja miyofteh) after 10-15 days. If refrigerated, it will keep for a long time. With Persian food, this torshi goes quite well with various types of kotlet and shami and goosth koobideh and abgoosht. It will also be nice with herb-infused types of rice like bahgali polo and sabzi-polo. To enjoy with Western dishes, torshi bademjoon is best enjoyed with rich and meat-centric dishes like pot roast which it will brighten; or with dry, somewhat bland types of food like chicken cutlet, which it will enliven. Lovely, as always, Azita! I want to try so many recipes from your blog! I love them all! Thank you dear Darya! I can say with 100% sincerity that I feel entirely the same way about your blog and recipes. Beautiful, plump, deeply hued eggplants have been on my mind, and this is a terrific new way to prepare them — you rock, Azita! This looks great! Last year I felt like I had eggplant coming out of my ears from my CSA share. It’s not my favorite vegetable to begin with and I had trouble finding new ways to use it. Every time I go pick up my share, I brace myself waiting for the cycle to start again but so far no eggplant. If I do come into some I certainly want to try this. The sour flavors sound amazing. I didn’t like eggplants, either, when I was a kid, but now I love them! It had to do with the skin and seeds, I think. That’s why your recipe is perfect! Just love Persian food! So glad I found your blog! Yes eggplants don’t look very pretty at all but are pretty on the inside where it counts! : ) I’m really happy you found me too Novice Gardener – I look forward to exploring your blog. Love this post! I am so fond of your blog and want to try so many recipes! Now…I have never hear of angelica powder, I’m going to do a little search on it. I have to try this eggplant. We call angelica “golpar” and also use it to sprinkle on pomegranate arils … not my preference actually but it’s a traditional thing to do … and also use it on cooked fava beans. This eggplant pickle I’m pretty sure you’ll like and it’ll be really really nice with meat and pasta dishes. That’s actually one of my favorite ways of pairing it because it cuts the starchiness of the pasta and heaviness of meat. I use roasted eggplant every week for an Indian style recipe. Will try this out this week. Looks yum! That’d be great! I’d love to know more about your Indian style recipe for roasted eggplants. Let me know if you have your recipe already posted? I love using eggplants in every which way. Roasted eggplants are so flavoursome… this dish sounds very yummy… love your photographs and your writing! Thank you Lizzy! I love eggplants and agreed that roasted ones are just entirely flavorsome. I am drooling as I am writing. I love eggplant torshi! That jar will be empty at one sitting, if I’m there! I find the literal translation of spinster simply brilliant! What a perfect concept! I really like the rhyme too!!! – Would love to try this but there’s little to no chance of buying angelica (which I grew only ever once years ago – majestic plant). Any sub that you would recommend? You know, let me consult with the grand chef (my momma to be exact) and see if she’s any suggestions re subbing ground angelica. but personally I would say if you add the dried mint it should be OK if you skip the ground angelica. I must admit to laziness, I mostly buy my pickled veggies and I love pickled garlic! Iranian manufactured brands can be found here if one looks hard enough. Can you define the “black seeds”? Nigella or black sesame or mustard? Eggplants/aubergines in my experience tend to have seeds when they are older. I have long ago stopped salting eggplant to “remove bitterness” BTW as IMHO opinion that has been bred out some time ago although older ones can be a little so. Lesson: buy ’em fresh and use ’em quickly. Ross I think black seeds and Nigella seeds are one and the same. I may do an entire post about this particular spice however so keep posted! Interesting what you mention re salting eggplant. My mom is adamant about it but I’ll follow your example next time and see if indeed bitterness has been harvested out of the modern eggplants … which would be convenient if true and yet rather frightening that they’ve messed with a natural flavoring of the vegetable. Awesome! That’s be cool. Let me know what you think if you make it. I love eggplants and I just know I will love this torshi. Do you also say batenjoon? Because we say bademjan (formal) and bademjoon (informal) … and agree, finding these links in food, culture, rituals and lingo is one of the funnest joys of writing/reading food blogs. Very interesting! I expected that the eggplant would be cut into spears to look like what I associate with American pickles made with cucumbers. Never seen a pickle spread! I bet this is delicious. I like how you put it that this is a pickle spread, because you’re right, that’s what it is. I really really think you’ll like it if you try it. I love torshi, had it on the table with just about every meal. I love the tart and tangy pickled vegetables. I have never had eggplant torshi before, I totally feel deprived. It sounds so good and really is simple to make. Need those black seeds (Nigella) have everything else. Yummy, yummy, yummy, this is love in my tummy. I completely forgot about this and I don’t know how, because t’s one of my all time favorites. My sister-in-law used to give me a jar on the side,(yavashaki), because it’s embarrassing to hear a grown woman moan in delight over torshi. Thank you, my gloriously wonderful Azita Jooooooon. Oh Yvonne, what can I say except that you delight and make me laugh every time I read anything by you and from you on whatever platform. I love eggplants! This sounds super flavorful and delicious. YUM! It’s a good gateway Persian torshi for eggplant lovers! I love the look of this recipe but what I really love is your bright blue bowl! It’s so cute! I want one. I have to admit, I continue to be infatuated with it as well. And it even has an equally adorable red colored sibling! I love this! If you can post a how-to for Fesen Joon I would be sooooooooooooooo grateful!!! Do let me know if you make it, OK? Wow, this is a completely new way for me to pickle eggplants! Must be very good in the texture and tasty! Mummm! Love eggplants! I must try! Le français c’est parfait :)! It’s happening now, eggplant pulp draining. They were young and fresh (like someone’s dates) so few seeds and those palatable. I was reminded of a promo from local SBS TV where the cook says that they were so poor in Lebanon that her mother would give her the crown of the baked eggplant as a treat. In fact they were quite tasty but my grandkids would revolt if I tried that. Very cool Ross! I want to see pictures please! Ah! Wouldn’t that be something? If we could do a giant bloggers feast and all meet in person? So looks like we were on same wavlength. Your pickle eggplant sounds great actually. But wait … goat curry? … never would have seen that coming. expect you’ll blog about it?